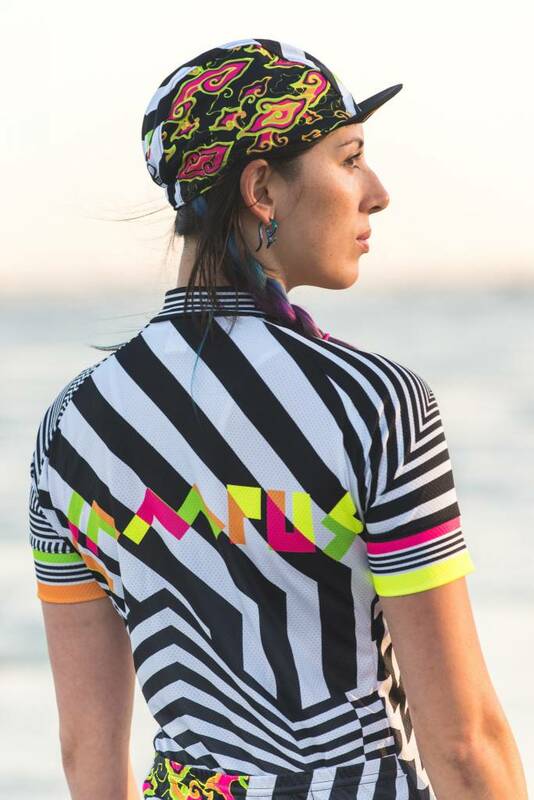 Mega Dazzle is the new epic cycling kit from Campus WheelWorks. 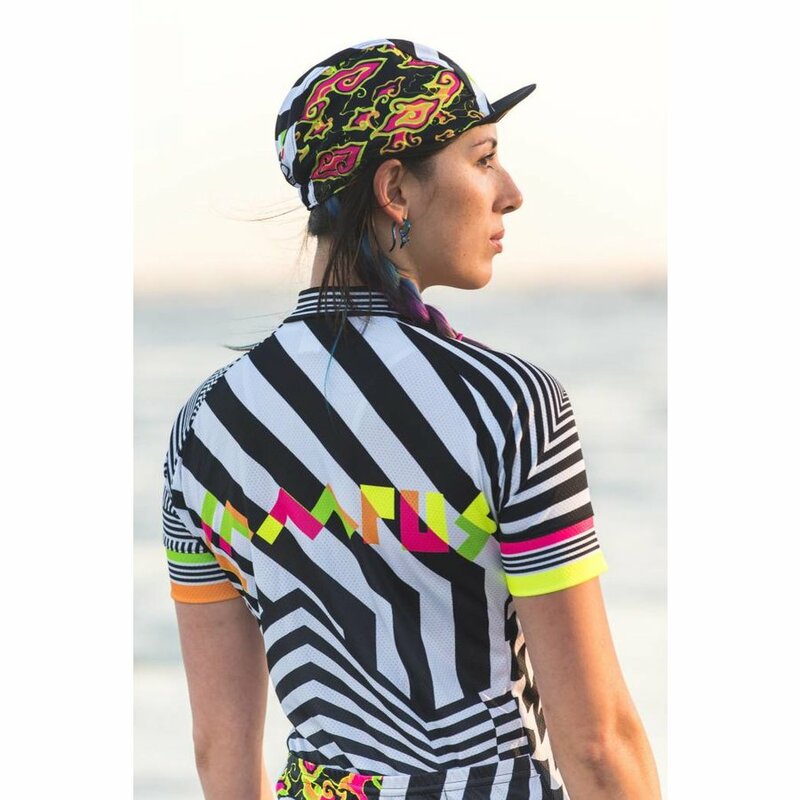 We have combined two very unlikely ideas: Razzle Dazzle and Mega Mendung into one kit that screams "Awesome! ", "I'm riding a bike!!" and "I know I look good." 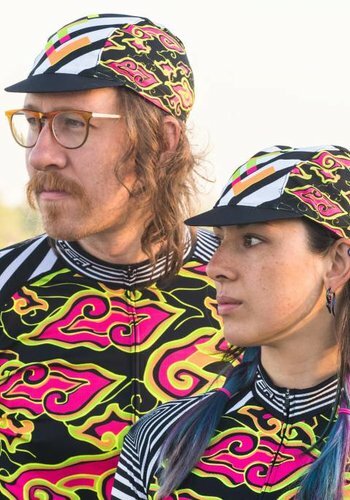 We partnered with Voler to sew our kit design this year. They put out a really nice finished product, with very high quality fabrics, printing and construction. Mega Mendung is a classic batik pattern from Cirebon on the north coast of Java. It represents a cloudy sky reflected in a pool of water. It's pattern implies the ever changing nature of life and the need to reflect and be humble and calm our stronger emotions. Razzle Dazzle is a type of camouflage painting that was developed in the early 20th century to prevent ships from being sunk by submarines. The idea is to create a pattern that is abstract and visually confusing to obscure a ships movements. We've wanted to do a dazzle kit for years. 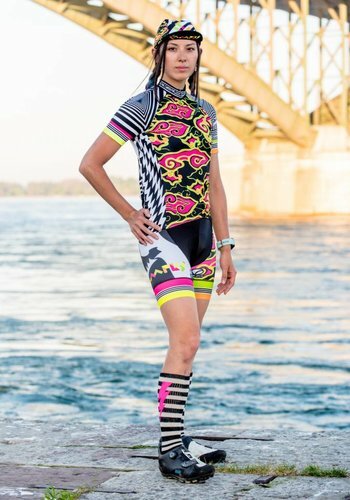 Unlike the ships on the water we choose a dazzle pattern to make you stand out. Thus we bring you Mega Dazzle. 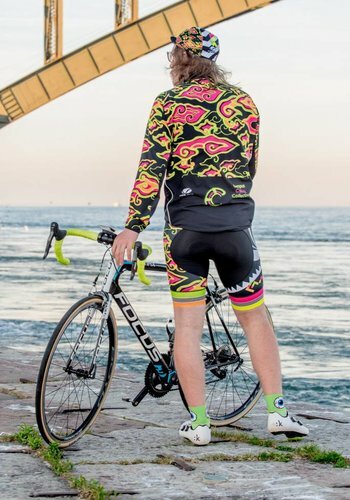 The improbably amazing bike kit. 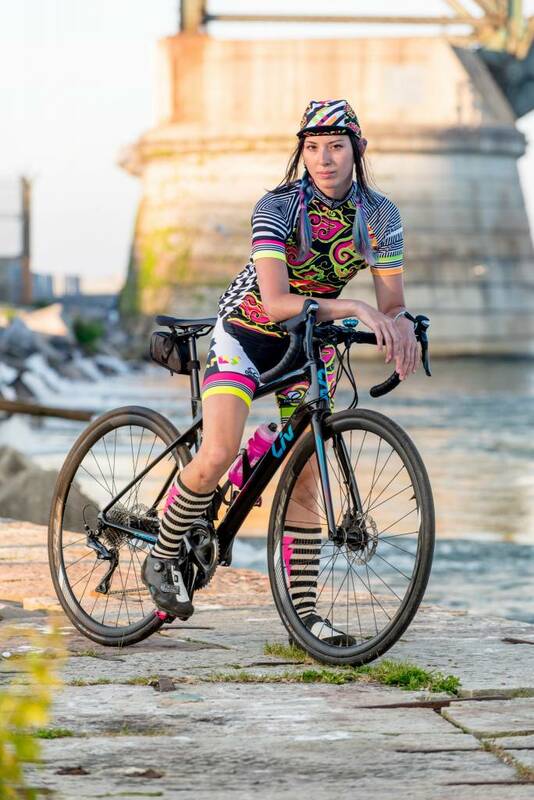 The Peloton DX jersey was designed with the features needed for everyday comfort and performance. 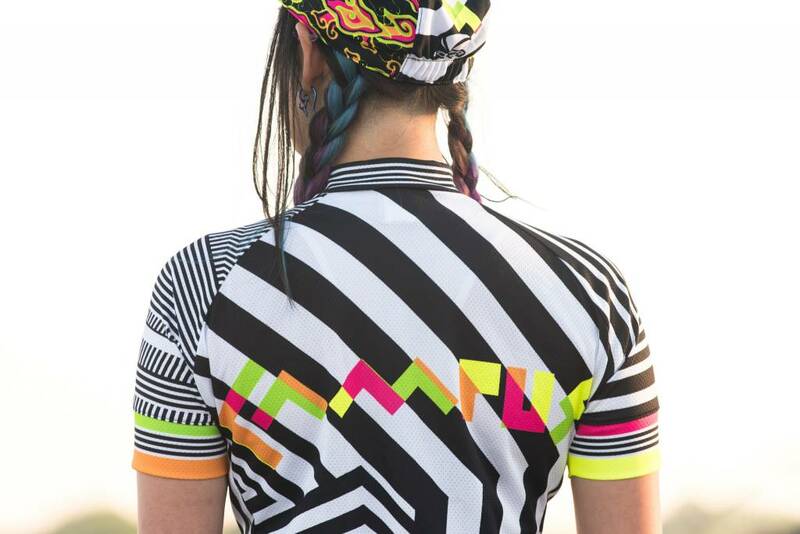 To ensure the ultimate fit, our jerseys are available in both a race cut and club cut. The race cut is a more tailored European fit which is narrower in the chest and waist. The Club cut has a relaxed fit and is larger through the chest, back and waist. 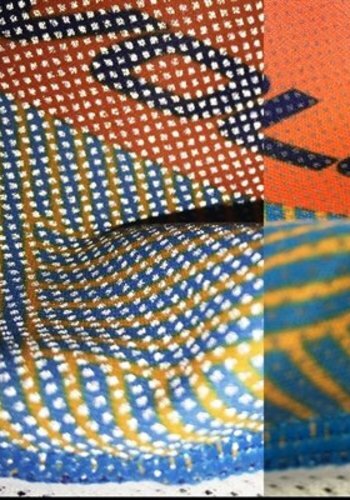 Genesis fabric. No elastic, comfort armbands and Voler silicone waist gripper for better fit. All jerseys come with three rear pockets. 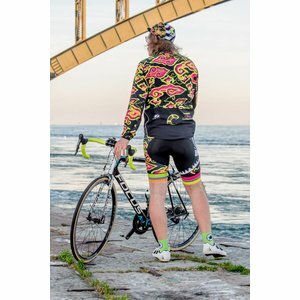 Optional Pixel reflective pockets are available. Full-length locking hidden zipper standard. 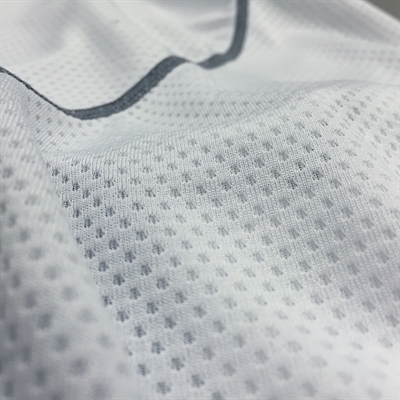 Genesis is the new generation of performance fabric. The micro denier Polyester yarns are designed to transport moisture through channeling, which pushes the moisture from your skin to the outside of the fabric where it can evaporate more efficiently. 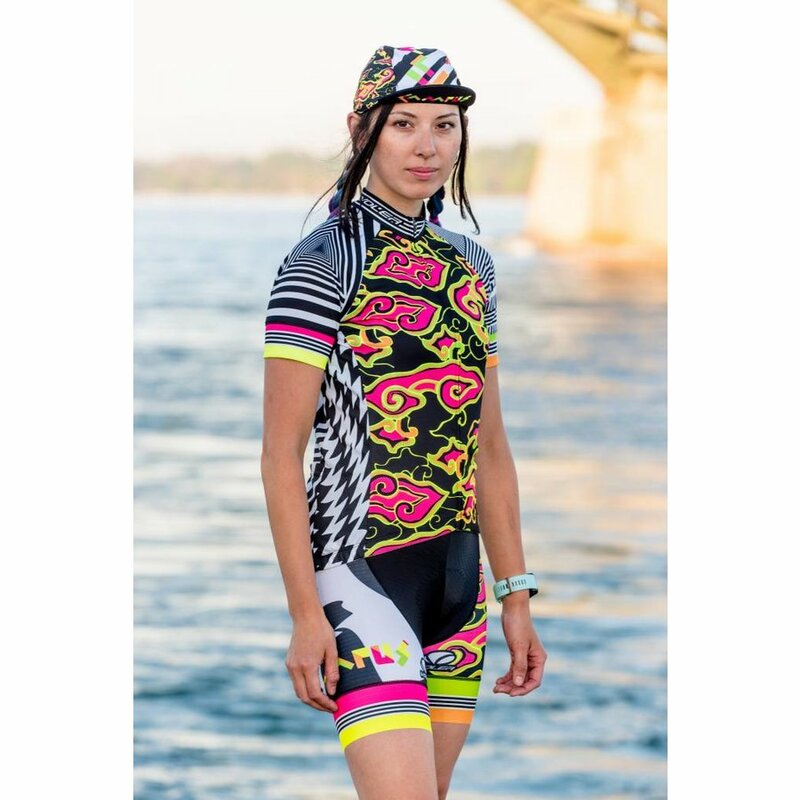 The fabric has superior sun protection with a UV rating of 28+. The micro denier yarns also provide a soft and comfortable feel along with being durable. 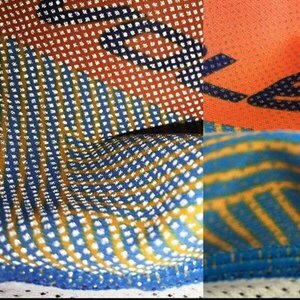 Highly reflective Pixel fabric covered with thousands of screen printed glass beads that illuminate when struck by light, increasing visibility in low light or night time rides without compromising breathability. 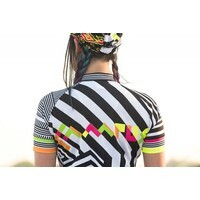 * Pixel is designed to be used for low light rides and is not intended for everyday use. The glass beads can yellow over time from extended exposure to sunlight. 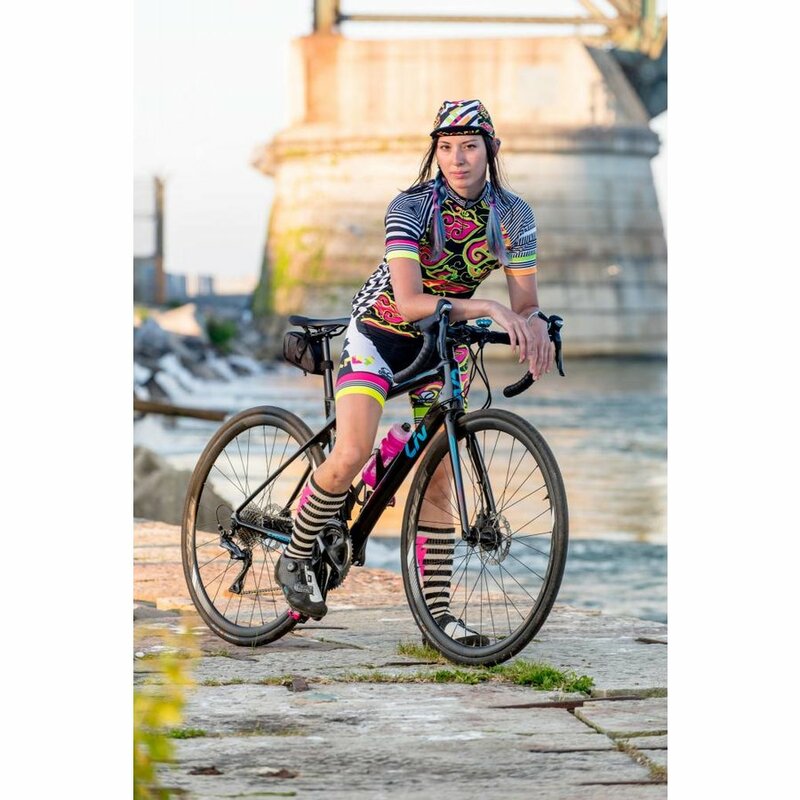 Mega Dazzle bibs only from Campus WheelWorks. 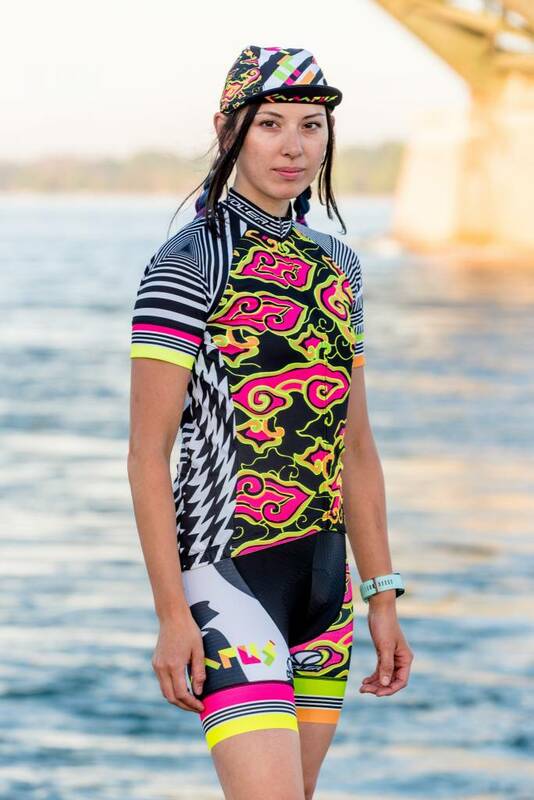 Exceptionally comfortable fabrics two women's specific chamois options, and one of the coolest kit designs in years.